A man has been fined and expelled from Croatia after he punched a Mediterranean monk seal, one of the world's most endangered species, reports said on Thursday. Dozens of tourists and locals had gathered on the beach at Gortan bay on the northern peninsula of Istria—a protected habitat for the monk seal—when a 56-year-old Macedonian man suddenly rushed forward and started hitting the seal with his fists. The seal was not injured and managed to flee from the beach into the sea, state news agency Hina reported. The man, whose name was not revealed, was sentenced to pay a 210-euro ($280) fine and expelled from Croatia for five-year period for "breaching the Law on Nature Protection," Hina said. 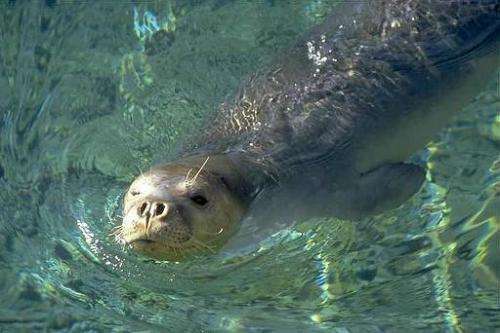 The Mediterranean monk seal is one of the rarest sea animals, with less then 600 remaining individual mammals registered in some parts of the Mediterranean Sea and the Atlantic ocean. One of the most endangered mammals in the world, it was for decades believed to have been extinct in the Adriatic, but since 2005, several animals have appeared in the waters around northern Croatian port Pula. This video clearly shows the tourist didn't punch the seal, just wanted to pet while the native bathers shouted at him to not touch it. I feel sorry for the man but - the law strictly forbids to disturb the seals in any way and he clearly broke it. I would have just fine the man, expelling him from the country with 3 year ban on entry is slightly harsh in my opinion. Did the monk seal turn the other cheek?